Looking for your favorite brands? Well look no further, we have them all with our affiliates at CheapHumidors.com, BNBTobacco.com, StogieBoys and South Smoke Shop . Everything you need for for your cigar needs. We have all of the major brands from 1876 Reserve to Zino Platinum Scepter Series. We carry a complete line of accessories from ashtrays to Zippo's®. Need a nice gift and don't know what to get? Try one of our Samplers. How about a bundle for your humidor? GET YOUR DOG TAGS NOW! 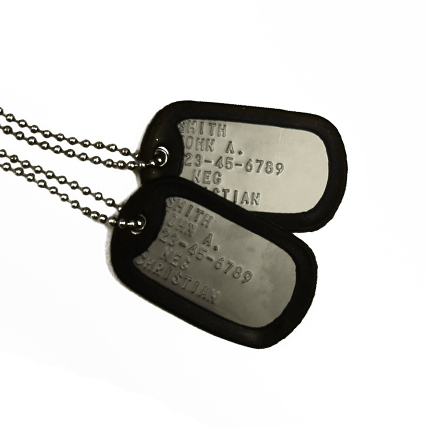 U.S. Military Dog Tags are embossed on MilSpec stainless steel plates. Don't pay more and wait days or weeks for cheap outsourced stamped aluminum. Manufactured IN-HOUSE the highest quality dog tags.